This interview originally appeared in Ink19. 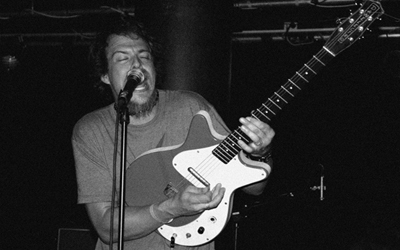 In the early nineties, Glen Galloway was a member of the San Diego noise rock trio Trumans Water and when the band moved to Portland, Galloway went solo to create Soul Junk. Over the course of 14 years he’s released numerous EPs and albums with titles using the decade 1950 as a starting point—EPs work down from 1949 and albums work up from 1951—on a variety of labels such as Sub Pop, Sarabellum, Jackson Rubio and now Quivery Society. Soul Junk is a dynamic mix of righteous raucous and sublime hush and most of all a constant exploration of the funky carnival noises going on inside the head of Glen Galloway. His choice of transmission? A swirling and jagged helix of simple and complex guitars chords, tripped-out turntable scratches, crashing drums and percolating percussion, cranked sampler knobs and free-flowing spontaneous lyrical fodder that pulls from his life and the Good Book. The unfortunate thing, though, is that for most of its existence Soul Junk has fallen into a strange situation despite the highly innovative tunes. Take just a brief look at rock history and you’ll see that using faith is one of the most common themes and when it comes to specific songwriters, the celebrated careers of Rosetta Tharpe, Bob Dylan and Johnny Cash come to mind as all having experienced the struggle of gaining acceptance by both the religious and non-religious music audience. Even though their music was groundbreaking their faith seemed to play a negative role in some way. And though Galloway is not nearly as well known as that legendary bunch, he can certainly relate when it comes to being a gifted songwriter, producer and performer and who is not afraid to be open about his faith in his music and like Tharpe, Dylan and Cash, he to has had a career that involves being shunned by the faithful for not fitting the holy mold or ignored by the non-religious for using too much of the Good Word in his tunes. Here in 2007 and for most of his career Galloway’s situation has involved the majority of the Christian music scene saying “Huh?” or “No, thank you” to both his avant-garde collage of hip-hop, rock and soul and especially his bold and outspoken lyrics that have called out on several occasions “the stagnation nation or suffocation of the origination” (see “Pumpfake” on 1956) he sees in much of the traditional and contemporary Christian music; while on the other side of the spectrum, labels like Sub Pop, although they fully embrace the creative ambition of Soul Junk’s songwriting style, weren’t quite sure how to market Galloway’s expression of faith. If you’ve never heard of Soul Junk, Galloway suggests that whatever type of genre you might prefer usually determines which Soul Junk albums you’ll gravitate to; earlier Soul Junk is more indie-rock and later Soul Junk is more hip-hop based. His albums—which have featured collaborations with Pigeon John and Sufjan Stevens—have received comparisons to the experimental genre gumbo of Beck and the slick and quirky break beats and rhymes of Mix Master Mike and the Beastie Boys. You could also toss in ’60s psychedelia, techno and whatever else Galloway feels like exploring when he’s in the studio. And along with that comes the fact that unpredictability is the only predictable aspect of Soul Junk, a quality that any Wilco fan can appreciate (or loathe). From 1951 to 1958, Galloway has flipped the script on die-hard fans by taking a sharp left and trading the noisy snarl of grungy guitar rock for tracks layered with beats and spacey overdubs. One thing’s for sure, it’s always fun to listen as Galloway follows his artistic m.o. : a constant demolishing and rebuilding of his own understanding of what music is. Even though a Soul Junk album has never made it onto the Billboard Hot 200, Galloway has still successfully made music his day job and managed to get an altered form of Soul Junk to the public’s ears via a different arena. In 2000, Galloway started Singing Serpent and has since made music for commercials for companies such as GE, Harley Davidson, Clorox, Nike and Citibank, to name a few. And chances are you’ve heard the tunes of Glen Galloway during a commercial break from your favorite sitcom, cartoon or Sunday afternoon football game. So during our conversation we touched on the perplexing career progression of Soul Junk as Galloway also explained his interesting perspective on touring and connecting with fans and the unusual recording process behind his new 1959 album, the first official and ambitious Soul Junk concept album. It rocks, it purrs, it messes with your mind and forces the wonderful aesthetic recalibration that every Soul Junk album before it has done. Had 1959 been released before 1984 it might have even changed Kevin Bacon’s final Footloose monologue. It’s been awhile since you’ve released an official album. How did you decide to go with recording an album based directly on the Psalms? Well, with previous albums 1958 and 1957 I was working with other musicians to create the songs and then all of a sudden there I decided I wanted to take a stab at creating an album where it was just me for most of the tracks. I was praying one morning and at that moment I decided that I needed to focus on just singing the Bible from front to back. In the past Soul Junk songs were made up of parts of the Bible with my experiences mixed in, so I took the last two years and sang the whole Bible on microcassette in lo-fi style so I was the only one who could hear it at first. I have been doing several projects at once for Soul Junk and over the last two-and-a-half years I recorded worship songs, all of Genesis that’s on the website and part of I John. It wasn’t until I got to the Psalms that I felt it was something I could release. I wanted to do this thing that I would sing the Bible verbatim but I also didn’t want it to be hard work to listen to. Some chapters in Genesis—which is going to be more hip hop when it comes out—you get like 53 chapters and verses and it gets to be too much and droning the same melody over and over again. It’s not that effective or great to listen to. You’ve mentioned in other interviews that you had plans to tackle Genesis first and work through the rest of the Bible. Was there something about the Psalms that made it easier to creating songs or was it that the Psalms were originally used for musical purposes that made it easier to record music to? I think that’s what did it. The minute I started working with the Psalms and tracking, it was amazing how much they were written to be made into songs. It’s kind of obvious but it really surprised me how easy it was to put them to music as compared to working with a narrative like Genesis or one of Paul’s letters. Your previous albums are a flurry of freestyle hip-hop lyrics and stream of consciousness Beat-style lyrics, and the melodies and tempos you usually work with are sort of an unpredictable chaos that’s very volatile and spastic. Somehow you pulled off the difficult task of maintaining your sound and successfully merging it with the structure of the Psalms. How hard was it to stick to the form of the Psalms and match what was in your head musically with what was on the page? Sort of like when you write a song that’s about a certain time in your life, you capture it but when you go back and try to sing it you realize that you’ve moved on or maybe matured by the time you get to singing or performing it live? Yes and I discovered during the recording of Psalms that your words express your feelings at that moment, whereas the words of the Bible seem to never lose their relevancy. If you ever read the Bible and don’t connect it’s not because the Bible lost its meaning it’s because there a recycling that goes on in our lives that our emotions and feeling go around in cycles and like any book or piece of music you’re sure that you will connect at some point with the words and their meanings. Since it was almost three years since 1958 was your mindset different by the time you got around to recording? Yes, it was. By the time I got to singing them my wife and I had two kids so for part of the project I was thinking what it might be like to grow up with musical versions of the Psalms, so you can have them as second nature as they’re set to music. So my wife and I would listen to the three of them in demo form over and over in the studio and it was very special to be able to create the album in that way. Making this CD I didn’t get the feeling like, ‘Ok I’m done with this track and it’s on to the next track’. I felt like this one never lost its edge and grew more powerful as I recorded it and it’s now that the album’s complete I can see never ever getting sick of because it was built of the experience I had making it. Since all the lyrics this time were taken right from the Bible did you have them memorized or did you have the Bible in front of you? Good question. Since I had I recorded it on the tapes it was a combination of having it memorized or opening the Bible with a mic in my hand and hitting go on the music. I would go down in the studio and try to sing six chapters before work with whatever melody would come to me and just go at and sing the chapter. And if I messed up a bunch I would have to go back and edit it. And I got very good at being tuned in the morning and thinking okay I have to get this right so I don’t have to go back and edit it. So after going through the whole Bible like that I can now just go back in my head grab a portion of the Bible and use that part of my memory as a beat to start a lyric. You mentioned it was you and your wife and two kids involved in the process of the album production? Was it like that for the other albums or was it a new thing for you? In the older albums I would disappear into the studio and come out and say, “Here it is,” or let people listen to rough demos. With this album I wanted to make things very simple. I wanted to make the songs more singable, too. Before when I was engaging the songcraft with Truman’s Water, we tried to blur the line between improv and actual songwriting and make one sound like the other. With Soul Junk the songs were shorter but they were built around very unlikely chord structures and I like writing a song where you take a vocal over all the beat tracks and then try to figure out how it worked by unraveling it. With the Psalms I was not starting with a musical puzzle that I scattered and then tried to put back together. It was more of taking these a capella melodies and then I let it fly and went with whatever melody God gave me at the time. I had these microcassettes demos for about a year before I really went into the studio and started tracking it. So did you have any sort of musical inspiration and can you explain what you mean by God giving you a melody? I’ve been learning about following instead of leading and as I was leading the worship at my church I was trying out a different kind of style of playing music. I thought I had done quite a bit in terms of music since I’ve been making music in bands for the last 8 or 9 years but really had a hard time connecting with the style of playing worship music in front of people. It’s really a different type of playing that confused me as I had a separation of – okay this is the kind of music you sing in church and this in the kind of music you’re really into like at a concert outside of church. So it all just kind of hit me and I realized that there’s something that God has to teach me beyond the intellectual puzzles of music I’ve put together by thinking that this type of music tickles my ear and thinking that I know all the reasons why all the other bands that sound like that do the same thing for me. So I realized I needed to be taught from scratch and I completely cleared the table and allowed God to show me about music from scratch. So as best I knew I tried to start fresh and make music on those terms and frame of mind and then try and see how it all fits into the kind of music I make. I’m still learning and will be for the rest of my life. What about connecting with people who don’t hold the same beliefs as you do about God and the Bible? Do you think an album like 1959 is limited in that way? I look at it like this. If music that I make touches someone, anyone, whether they believe in God or not, then I believe the music has done its job and that falls in line with my role as a musician—which is to not cloud the issue and just do what I love to do which is make music that I’m happy with and is true to who I am-hopefully that’s what people see and then maybe the other aspects like faith will come later. I really have no control over it beyond just being a conduit of what I hear and then trying to follow through with the type of music I know I need to make. There are a lot of passages in the Psalms that read pretty rough and candidly brutal about a wide range of human emotions. How was it working with that versus writing your own lyrics? The Psalms are full of raw and pure emotion and an excellent source of getting to the core of the human suffering experience. David wrote the Psalms when he was on the run from his enemies and he went through the normal track of emotions that any of us would go through and in all the emotions he was worshiping God by just being honest about how he felt and that happens in a lot of music but it might not be as obvious. Can you talk about Singing Serpent and explain how it started. It’s a very interesting situation and it sounds like a pretty good day job for a musician to have. We compose the music for commercials for companies like BMW. I’ve got about three studios around the country and ten composers and companies like BMW will come to us and ask us to put music to one of their commercials. I’ve been doing that for about ten years as my day job. Up until that time about ten years ago I had done odd jobs and for three years I taught high school chemistry and I always wanted to get a job where I was working with music or something that I’m good at or wired for. I knew I wasn’t going to be able to go off and tour with a family so I started looking for chances to get that ideal job that would fit that with the way I’m wired up and I got the chance to compose music for commercials. Then my boss asked me to run part of his business and then I branched off when I got some other local musicians to co-compose with me since I couldn’t do all the work with the new opportunities that started coming. And it grew into the business I have now. So during that time I began to collaborate with Soul Junk more on the side while doing commercial work with those friends and out of that swapping of work came 1956. By the time that record was done my boss wanted me to start doing ad work and I told him I just wanted to stick with the music and not do copywriting. So I decided to make the jump and chase down some start-up capital and we just went for it and started the company in 2000. And then we started looking around San Diego for other guys who were in bands that could help out who did their sound well, but could also be flexible with other sounds, and now there’s about 17 of us. Not a bad gig for a day job and starting a business like Singing Serpent is not something you hear about too often. Yeah, most of the time I try to keep Soul Junk and Singing Serpent separate but lately my thing has been to just let the two blend together and not worry about the merging. You’ve been on several different labels of the course of your career and now you’re on Quiver Society. How did you connect with them? It’s a very interesting story that goes back to when Soul Junk first started. At first I was surprised that the only people who were listening to Soul Junk in 1997 were people who knew my first band Truman’s Water, which was exactly the opposite of what I expected to happen. I expected Christians to connect with it but that didn’t happen at all. Soul Junk was getting written about in MAGNET and other indie-rock underground style magazines. So this guy named Lloyd Everly from Portland calls me and says he found a used Soul Junk vinyl record and he invited us up to Portland to play a music festival and everyone was singing my songs. Then on the way back from one of the many trips since that first one, I stopped at the home of Brian Fletcher—a member of the band Pilgrims and creator of Quiver—and he knew all about Soul Junk and I told him about my early ideas about Psalms and then he said Quiver would put out the record when I was ready. What about the cover art? Soul Junk albums always have a unique design to them. I did the sketch drawings for the cover art on Psalms which my friend Paul arranged into the final design. Paul and I have a long history of working together and he did all the artwork for 1957 and several websites for my business. That connection with a fellow artist is so important. I’ve been doing records for about 14 years now and then there’s times in the studio where you explain to someone what you want out of a song and they sort of get it but when you really work with someone who knows exactly what’s going on in your head and can duplicate it in the studio that really special and rare. Brain Cantrell who did the drums for 1952 and 1953 and now I’ve worked with him for the next set of Psalms 24-43 and he can create exactly what I have in my head. Since it sounds like you can’t just pick up and go on tour what’s next for Soul Junk? Not really sure at this point. I’m still trying to figure out how to work with the after effect of a fan that gets moved at a show and then we’re gone. I’m trying to answer the question of where does that person go after that? So for right now I’m playing with the idea of just having the website as the main spot where I connect with fans. I see it more as an immediate dialogue and I’m looking for things to develop out of that. If traveling comes out of that then that great but I’m not about to just drop everything and go touring right now. How about the music? Any hints on where Soul Junk might go next? The Genesis tracks that I mentioned earlier are going to be a return to the hip-hop version of Soul Junk. Some are down and one of them, “Mindjammers,” is up on the website and fans have already begun to respond to it. You should check it out. I think I will, sounds interesting. Thanks for taking the time.